The hip flexor muscles lie under your abdominal muscles. A group of muscles that includes the psoas major and minor, iliacus, sartorius and rectus femoris, the hip flexors connect your thighs to your pelvis. When they contract, these muscles bring your thigh and torso closer together. Because the hip flexors play a part in swim kicks, you might not be able to swim if you have an injury to one of these muscles. A 2010 article in “The Open Sports Medicine Journal” discovered gaps in the literature about rehabilitation and return to play criteria for hip flexor injuries. The type of injury, cause and symptoms play a significant role in determining the most beneficial exercises for your rehabilitation. Swimming may be one alternative exercise to include during your recovery, but it comes with some precautions. Consult with your doctor or an exercise professional before swimming with a hip flexor problem. A strain or tear of your hip flexor muscles or their tendons, which attach the muscles to bone, is an acute injury common with strenuous exercise or physical activities. For example, sprinting and other quick and forceful movements during sports such as tennis, football and soccer might cause a hip flexor strain, especially if the muscle is tight or fatigued. Tendonitis or inflammation of the hip flexor tendons is a chronic injury caused by repetitive movements and overuse. For example, tight muscles and repetitive kicking in soccer may lead to hip flexor tendinitis. A less common injury is called “snapping hip syndrome” or “iliopsoas syndrome” and is when the tendon of the iliopsoas muscle causes a “snapping” feeling in your hip that at times may be audible. For most hip flexor injuries, the first phase of rehabilitation should include rest, not swimming. The length of the first phase will be between two to three days and several weeks, depending on the severity of the injury. Then you may start a modified exercise program, which may include swimming. 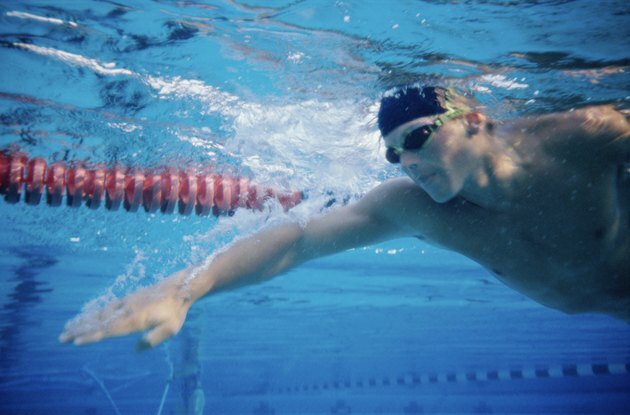 For example, runners and cyclists might be advised to switch to swimming while recovering from a hip flexor strain. Swimming may cause less discomfort and pain compared to running and cycling and may also help improve hip flexor strength. Therefore, when you are suffering from a hip flexor injury, swimming is likely a good alternative exercise compared to more strenuous exercises and sports. Do not swim for rehabilitation if you feel hip pain during swimming, you have decreased hip range of motion or your swimming technique may be improper. Swimmers with a hip flexor injury may need to drastically modify their swimming regiment, or complete the “return to play” criteria prior to swimming again. When swimming is incorporated into a rehabilitation program, progress slowly. Rehabilitation protocols may vary greatly based on individual circumstances and the physical therapist or athletic trainer’s background.